These hand grip extensions are perfect for low wheelchairs. They help staff maintain a more upright position when transporting residents and that promotes better back health! 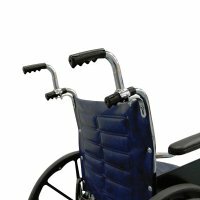 They fit most wheelchairs and install in minutes. No need to remove existing grips. Raises hand grip height by 5" Sold as a pair. You can earn 56 Ocelco Cash Reward Points on this product!